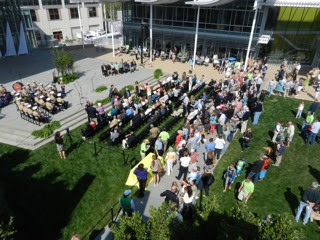 I don't know how your weekend began, but mine started this morning when my wife and I joined several hundred folks at the community celebration of the brand, spanking new Newport Beach Civic Center and Park. And a glorious event it was... 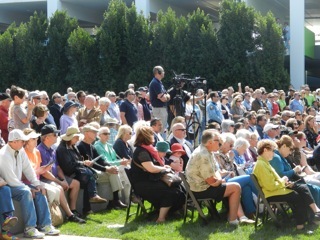 The crowd, full of dignitaries and just plain, old proud folks, was enthusiastic and enjoyed the steady breeze that pushed flags to full salute. 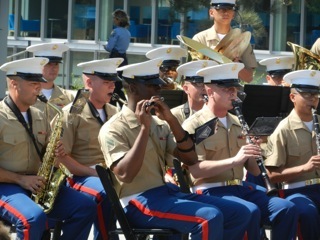 Music was provided by two dozen members of the 3d Marine Aircraft Wing Band. 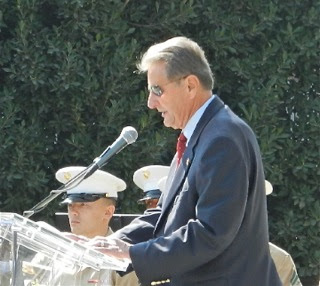 Mayor Keith Curry was the master of ceremonies, setting just the right tone for the day. Councilman Ed Selich provided an overview of the history of the City Hall creation. More than a dozen vendors provided what Curry described as a "mini-Tatste of Newport". 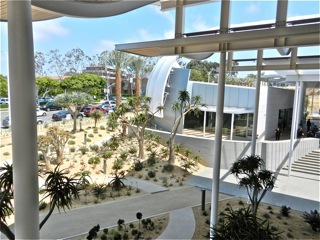 There's plenty of onsite parking - 450 parking spaces in a multi-story parking structure adjacent to the buildings. 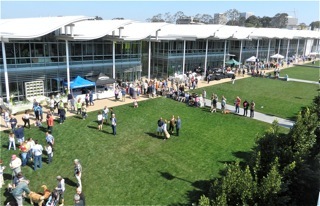 The Main Library is now a contiguous part of the Civic Center and shares the parking facilities. 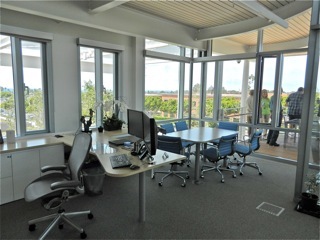 The facility is magnificent, with glass, glass and more glass. Few employees in the building are without an unobstructed view of the outside. Perhaps the best example is the office of City Manager, Dave Kiff. Not only is it in the perfect location with a lovely blue water view, but has a little deck nearby if he wants to soak up some sun during the day. Even though there are several of those decks around the perimeter of the building, I suspect Kiff is going to get some flack. 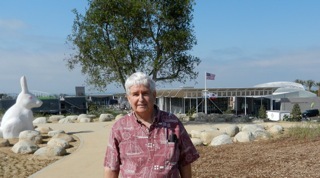 My wife and I arrived early and toured the grounds. 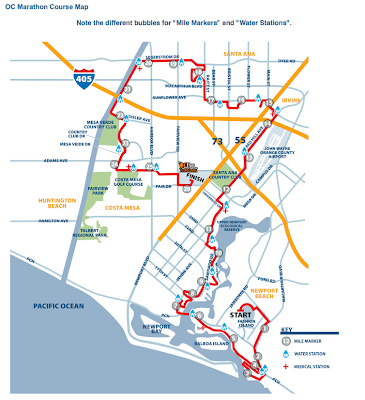 We hiked meandering paths through new landscaping and across several bridges over the native habitat up to the dog park on the other side of San Miguel Avenue - she climbed the stairs and I rode the elevator up to the bridge over the street. I mean, how many times do you get to take an elevator ride to a dog park? 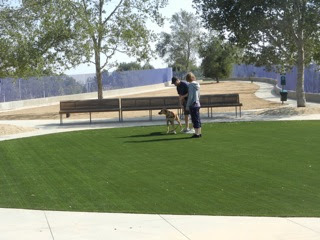 And a fantastic dog park it is, with two large areas of artificial grass - one at either end - and a huge dirt section between. There are sufficient shaded benches for the dog owners so they can just sit and relax as their pooches frolic and socialize. 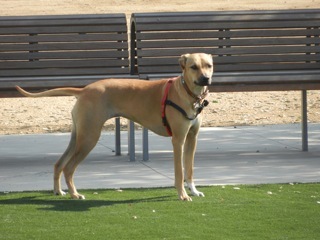 In fact, we saw the first canine visitor to the facility - this beautiful Rhodesian Ridgeback - who seemed a little confused since there were no scents deposited on the site yet. As we wandered the site we came across wildlife. Well, maybe not "wild life" in the purest sense. 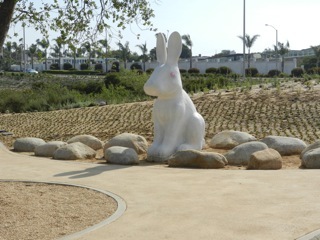 We discovered a big, white bunny statue, all alone, overlooking the Civic Center site. 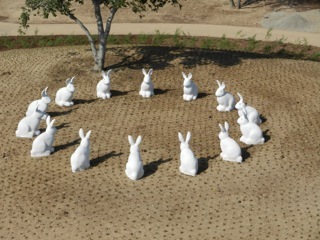 Then, closer to the elevator, we found fourteen smaller white bunny statues arranged in a circle. I have no idea of the significance of these statues, but they certainly were conversation pieces. 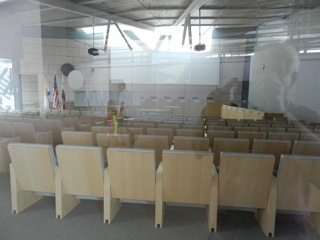 Although the City Council chambers was not open, we had a chance to see it through the sliding glass doors at the rear of the room. This venue is cozy - it only seats about 150 people - but those doors can be opened and temporary seats made available for the overflow. Or, the patio space could be used for standing room, which will be handy if and when angry folks show up with pitch forks and torches. 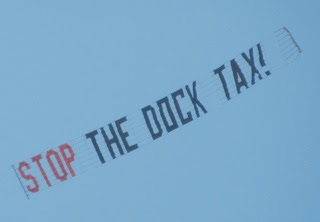 Speaking of angry folks, a negative exclamation point to the festivities was provided by two airplanes that orbited the site for a few minutes dragging behind them the following banners. Even though they were in full view of the crowd and dignitaries - I did see some scowls from council members - they didn't seem to detract from the very festive nature of the day. This really is quite the magnificent facility. 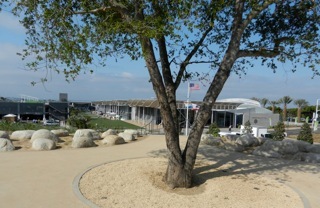 Once the landscaping grows a little it will be a spectacular place to just go and meander. 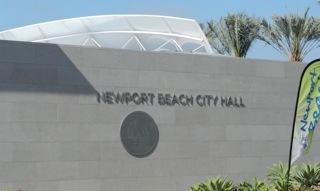 Every Newport Beach resident should be proud of this facility - even though it may cost as much as $230 million once the bonds are paid off. And, quite honestly, I feel just a little bit of pride of ownership for this place. 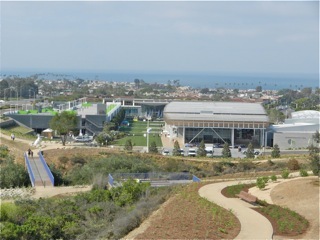 Many years ago, when Newport Beach seemed determined to demolish the old site on the Balboa Peninsula and rebuild a new facility there, I wrote a little commentary in the Daily Pilot that asked why they would intentionally build at a site you almost cannot reach during the summer months when they had this fantastic, 12 acre site in the geographical dead center of the city, close to public transportation and adjacent to their largest retail center - Fashion Island. I mean, that venue is called "Newport Center", after all. I suggested that space adjacent to the Main Library could be carved out of that 12 acres for a new City Hall and still have plenty of room for the open space for which it was intended. Apparently somebody was listening. As reported by Bradley Zint in the Daily Pilot last night, HERE, the recall effort to unseat Mayor Jim Righeimer launched by former City Council candidate Chris McEvoy has failed. 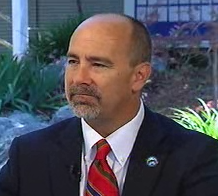 McEvoy needed to collect more than 9,000 valid signatures by May 15th to force an election on this issue. In actuality, that means he needed somewhere north of 11,000 total signatures to be sure he had enough qualified signatures to qualify. I'm not surprised this effort failed. McEvoy, long on enthusiasm, but short on funds and organization, ran the barest of bare bones efforts - just as he did when he ran for city council. The reason he gave for launching this campaign against Righeimer - his vote on the Banning Ranch Transportation agreement - was weak. 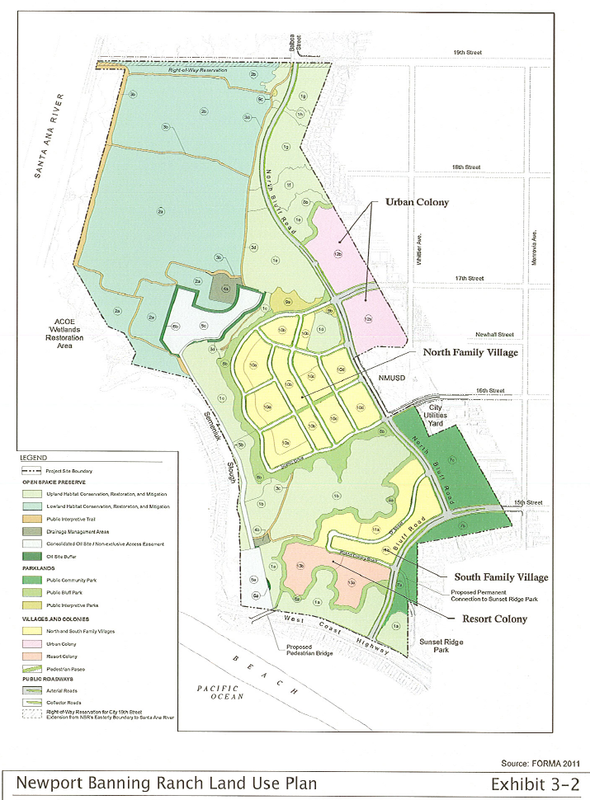 There is NO agreement between The City and principals of the Banning Ranch development. We don't disagree with McEvoy's concern about the proposed Banning Ranch development - it will create a tremendous traffic impact on the Westside of Costa Mesa. That battle is far from over. 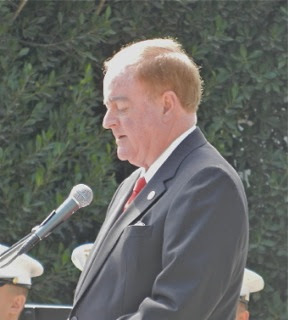 We hope McEvoy will continue to be engaged in issues in our city and speak out when he feels it appropriate. Business License Fees - No Discussion? 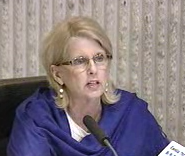 Earlier this week the Costa Mesa Finance Advisory Committee held their regular monthly meeting and the agenda for this one included a discussion - requested by Council Member Wendy Leece - of the Business License Fees. Bradley Zint provided a summary of that meeting in the Daily Pilot, HERE. Some will recall that there was a short, un-productive discussion of this issue in July of last year before the council - fully immersed in Charter and other election-related issues - blew off any further consideration of the subject. 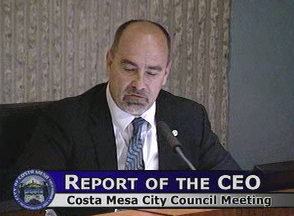 Presently the City Of Costa Mesa has one of the lowest Business License Fees in the county - and maybe the state. The highest fee any business pays in our city is $200. Two Hundred Bucks! The last time anything was done to the fee structure was 1985, and that was minimal. We're basically working with a Business License Fee structure that's been in place since 1961. 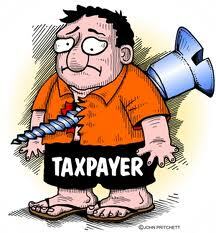 The city receives just under $900,000 per year from Business License Fees - less than 1% of all revenues. Nothing can be done about increasing the Business License Fee until the General Election in November of 2014, but that doesn't mean we shouldn't be talking about it. The City certainly needs more revenue, especially now, with the specter of having to give the State more than $2.5 million from the defunct Redevelopment Agency. Last July Finance and Information Director Bobby Young provided staff reports and excellent exhibits for the council to consider. 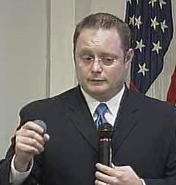 He provided a staff report dated July 10. 2012 HERE and a discussion dated 7/12/12, that included an excellent report on Business Tax Classifications and Rate Structure Report, HERE. There is also a Comparative of business licenses of other cities, HERE, and other Business License Tax Information, HERE. I think the council slammed the door to their minds when they saw a $10,000 annual license fee for those businesses with revenues over $25,000,000 who presently pay $200. 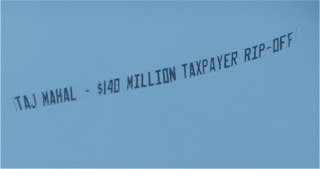 That was a deal-breaker in the eyes of many, including outspoken critic of ANY fee increase - realtor Larry Weichman. Recently, though, he's implied that he's willing to discuss some kind of change. Personally, I think that $10,000 number is excessive, but some changes do need to be made to our policy. For example, ANYONE who has an active business license should pay something to keep it open and active. 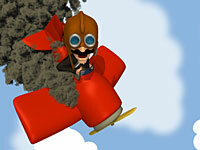 Currently 600 license holders pay nothing - ZERO - to keep the license active and another 2,000 pay only $25.00. In fact, more than half the total license holders - 5,750 - pay less than $100 to keep their licenses open, including businesses with gross revenues of $200,000 per year. In my view, the minimum charge for keeping a business license open should be $50.00, whether there is income or not. The charges should be scaled up from there, perhaps quadrupling the fees charged to a maximum of $800 per year. I suspect Weichman, Nordstrom, Macy's, Robins Ford nor any other business will not balk at that number and it could give us an additional couple million in revenue. Regardless, there's plenty of information available in those exhibits linked above to generate a healthy discussion. If this council choses NOT to even discuss increasing the Business License Fee, then they are ignoring their fiduciary responsibility to this city. And, oh, yes, I do agree with those who say we should do a much better job of collecting the fees that are due under the current system. Perhaps we should hire the biggest, meanest guy we can find - maybe one of those early-released ex-cons - to become our Business License Fee Enforcer. He could go door-to-door with a list of deadbeat businesses and politely suggest some form of payment - or else. Sacramento Bandits To Be Sued For "Theft"
The City of Costa Mesa announced today that plans legal action against The State of California following a demand that The City hand over $2.5 million in loan payments it received the past two fiscal years from the former Costa Mesa Redevelopment Agency. See the press release HERE. Perhaps the most interesting part of this press release is the quotation from City CEO Tom Hatch, who said, "This is outright theft by the state, and it's an outrage to Costa Mesa taxpayers." I agree. The worst part of this - besides staring at more $500 per hour legal fees - is the fact that it might mean that The City will be screwed out of the remainder of the original loan made to the Redevelopment Agency more than 40 year ago - $9.8 million! And, a byproduct of this event may be the caterwauling we'll hear from proponents of converting to a Charter City - who may yap that "This never would have happened if we were a Charter City. ", which is a bunch of manure. It would have had NO effect at all. So, the litigious life in Costa Mesa moves forward - what would it be without a lawsuit or two? It's a heck of a way to run a city. A reminder... the Orange County Marathon will be held this Sunday, May 5, 2013. 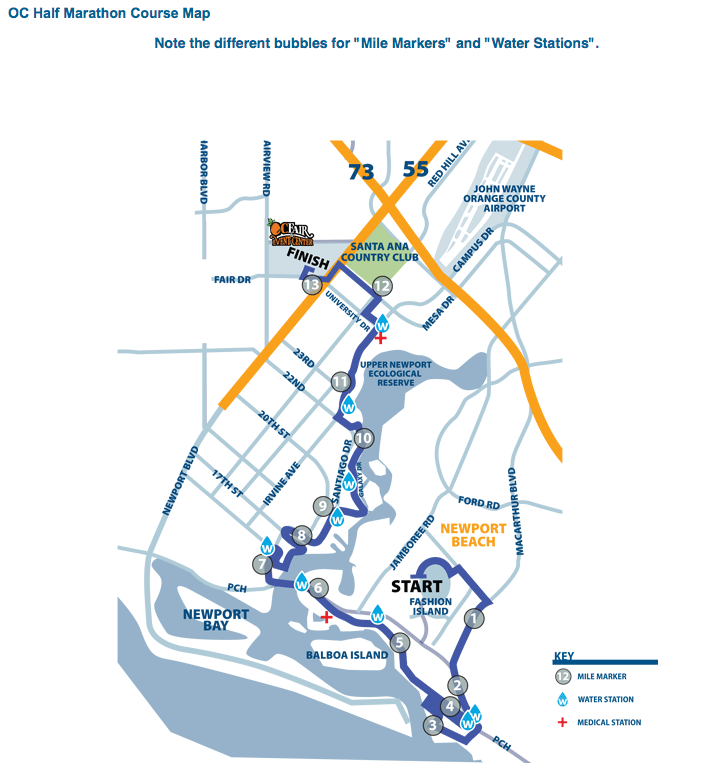 The event includes the Full Marathon, a Half-Marathon and the Wahoo's 5K race. You can find everything you need, or want, to know about the race at the home page, HERE. Also, you can read about all the road closures HERE. I thought this was going to be an easy week, hoping for a reduced schedule so I can whip this darn cold. Ah, but it is not to be. Tuesday, April 30th, there will be a special City Council Meeting in council chambers beginning at 4:30. You can read the agenda HERE. It looks like this one is going to be a closed session, from which they typically don't return to report out, but you just never know. Before that meeting starts, though, the Financial Advisory Committee will meet in Conference Room 1A beginning at 3:30. The agenda for that one is HERE. Of note is council member Sandra Genis' Wendy Leece's request to review Business License Fees. The public is welcome at these meetings. Since several members are also associated with the Mesa Water District, which is exploring ways to modify their investment policies to include higher-risk investments, and since our committee is exploring using a middle-man to handle some of our investments, these meetings may be enlightening. Wednesday, May 1, 2013, the brand new Pension Advisory Committee meets, also in Conference Room 1A, but at 4:30. The announcement is HERE, but no agenda is available now. NOTE: Agenda now available HERE. 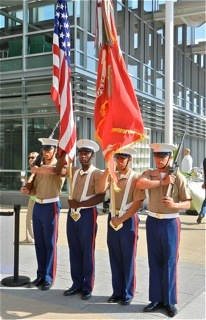 I suspect they will elect officers and begin to chart a course for the future. Perhaps they will discuss the recent announcement by Cal PERS that it has approved employer rate hikes of 50% over the next few years, HERE. They might also discuss recent announcements like the one HERE, in which the San Jose City Council discovered it cannot afford to bail out of CalPERS for current and former council persons - too costly. And, they will certainly discuss the announcement last week that CalPERS investments have surpassed prior record highs, HERE. Should be an interesting launch for this group. Thursday, May 2, 2013, at 5:30 in the Emergency Operations Center (EOC) adjacent to the Police Station, the 60th Anniversary Celebration Committee will meet again to discuss the fine-tuning of their plans for the launch weekend. You can read the agenda HERE. Vice Chair Melinda Lowery will be in charge of this one. Also on Thursday and overlapping with that meeting is the Tip-A-Cop event at the Claim Jumper at South Coast Plaza. 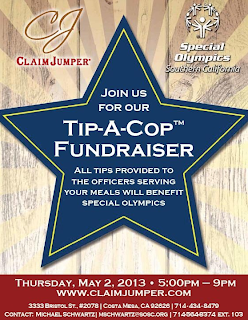 From 5-9 p.m. the meals at that fine restaurant will be served by members of the CMPD and all tips provided to them will go to the Special Olympics. And, no, boys and girls.. it doesn't mean you get to push a cop over - as in a popular pastime back in Jim Righeimer country - cow tipping. 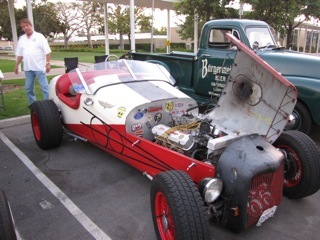 Friday, May 3rd, is the latest installment of the First Friday Roadshow - the classic and hot rod show in the City Hall parking lot beginning at 6:00 p.m. As usual, there will be lots of great classic cars, music and food via a food truck - and it's free (the show, not the food). 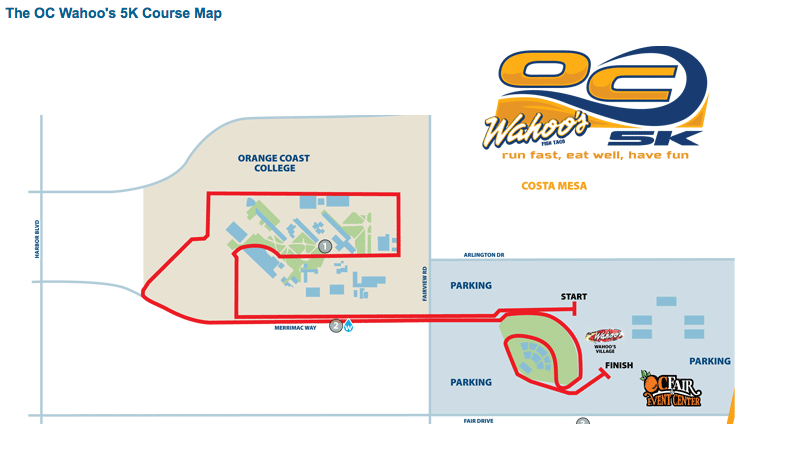 And, last but not least, Sunday, May 5th, is the Orange County Marathon! 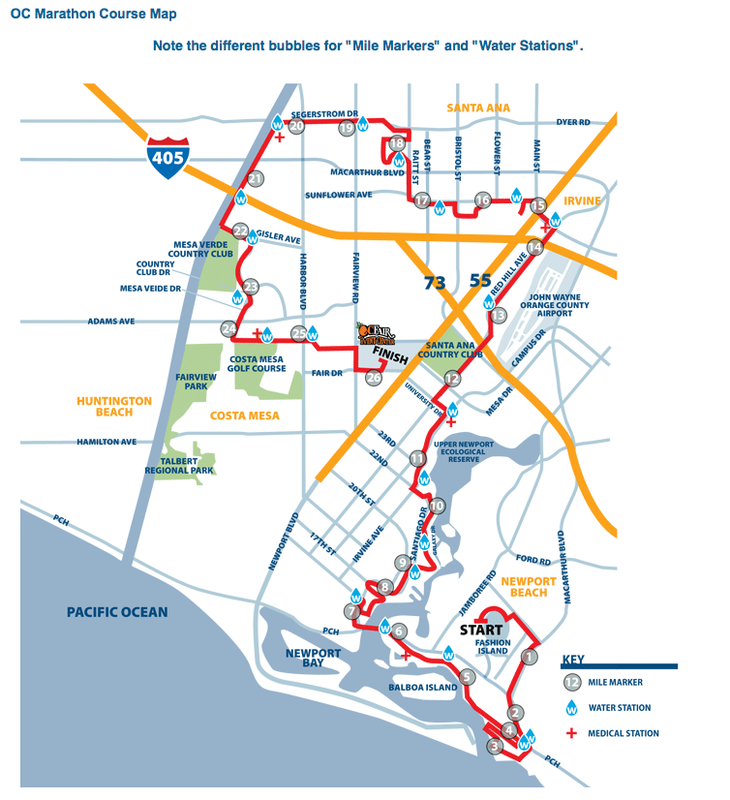 Go HERE to their website for all the information, start times, road closures, etc. 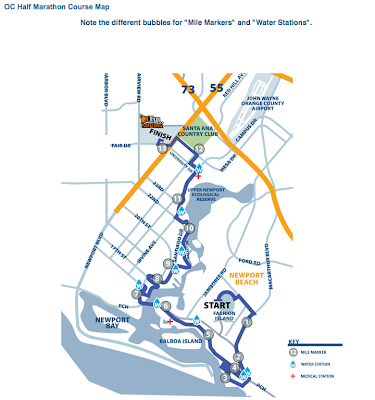 This should be a very fun event and the weather report calls for a warm weekend, so stay hydrated, folks.